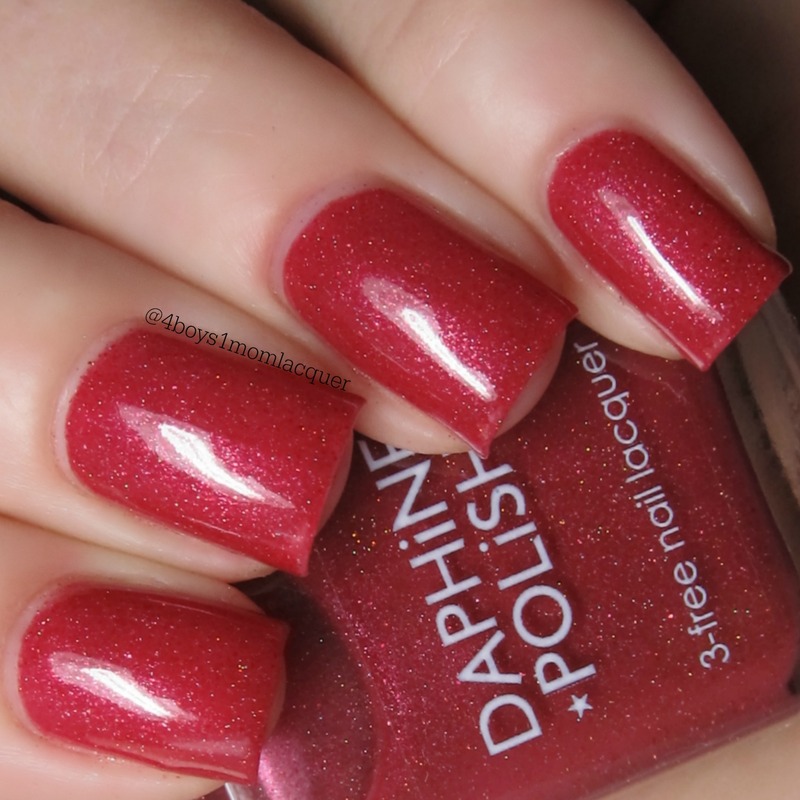 Today I have a collaboration collection by Daphine Polish to show you. Daphine Polish and a company called Bumblesoaps came together and made amazing products for gifts sets that will be available for pre-order on February 2nd through February 4th.The boxes will be available by scent and will include a variety of products: body butters, bath bombs, bath truffles and Daphine Polish nail lacquer,etc.The boxes will range in price from $17-$29 plus shipping, depending on the scent chosen (ie. the Bite Me! box may be $17 but the Twilight Nights box may be $29, the different bath & body items in the boxes are why the prices fluctuate so much).The items in the boxes will vary for each scent. The specifics will be on the Bumblesoaps Facebook page and website (www.bumblesoaps.com) . There will be a full set, with an exclusive gift, available for $100 which includes shipping. Pre-orders are expected to ship in approximately 4 weeks. The preorder will be taken on the Bumblesoaps website. 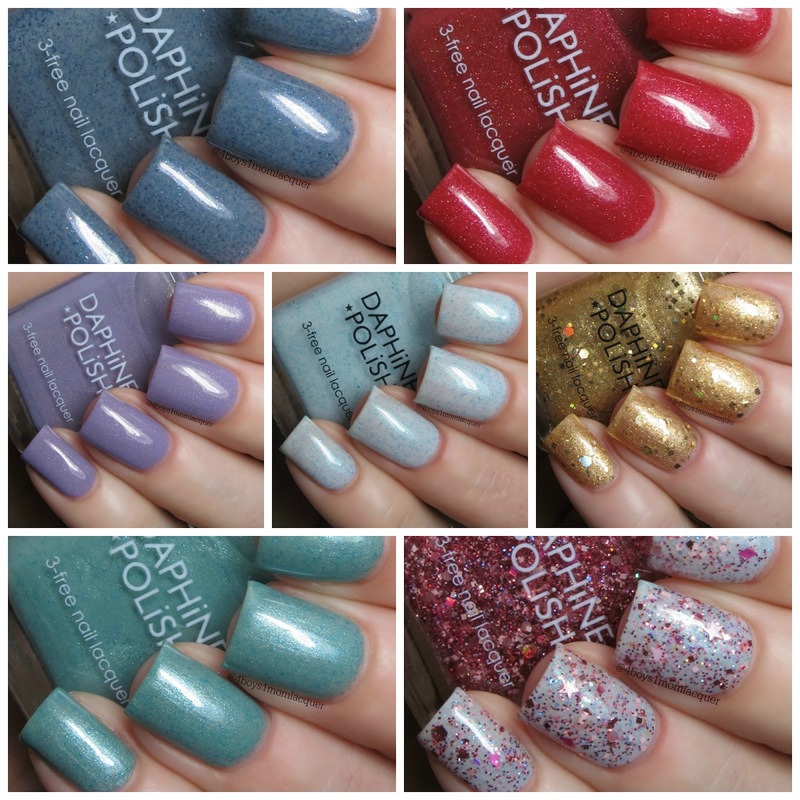 After the pre sale boxes ship,Daphine Polish will have the individual polishes listed on her site as well as the full collection. Daphine Polish will have the usual whole collection set available at the discount price ($1 off each bottle) as well as a special set where you the customer can choose one to leave out (so if you bought the box you don't have to get an extra polish) with the discount price. Daphine Polish will only make this available for a limited time,possibly for 2 weeks.I also forgot to mention an important fact,the polishes are scented.If you use scented nail polish remover or cuticle oil you will love these scented polishes.The fragrance in the polishes smell AMAZING!If by any chance these polishes that I'm about to show you don't interest you,which I know they will,you should still check out the products in Bumblesoaps shop.The items looks fabulous and well make.I want one of everything!! Lets take a look below at this collection. Twilight Nights is described as a creamy, dreamy lavender with gold shimmer and holographic effect. 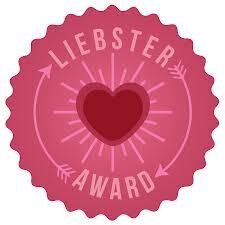 Scent Description: (Lush type) Eucalyptus creates lift for this romantic floral blend of lavender and lilac. Warm woods soften the bouquet as gentle sweet notes of sugared vanilla and white musk add a soft background. This polish applied perfectly with no issues.It is completely opaque in 2 coats. The fragrance in the polish smells divine. Not overwhelming at all. Tinsel is described as a blue-hued white crelly that has a strong blue shimmer for that extra oomph. If the glimmer of ornaments and silver strands on the tree had a smell, it would smell just like this blend of pomegranate, strawberries, and raspberries, with a subtle hint of fresh peppermint laves and fresh vanilla. This shade reminds me of yummy breath mints with the tiny specks of winter-fresh.This polish applied with no issues.A third coat might be needed if your nails are a longer length. #SmellsLikePink is described as a dozen pink glitters that make up this fun, girly glitter bomb. What else could be in this polish but all the pink? An incredible iced champagne mixed with rich sweet raspberry and cranberry. I applied 1 coat of #SmellsLikePink over 2 coats of Tinsel,followed by a quick drying top coat. There is tiny stars in this polish that are so darn cute.I'm a sucker for those tiny things.I did not have to fish for the stars.It's a hit or miss really.Either you get stars on your brush or you don't but they do attach to the brush pretty well. If you absolutely need a star on every finger then you would have to fish for them because there is not a whole lot of stars in there. Bite Me is described as a deep pink-leaning red with dark red shimmer and copper holographic sparkle. Bubbly lime and orange mingle with a luscious blend of berry and cherry, combined with hints of leafy greens over a base of vanilla to finish this sweet and fun scent. I really love this polish.The red shimmer and copper holographic sparkle are a perfect combo with the color of the polish.It can't get anymore perfect than that.No issues to report. Under the Sea(may be labeled as Sea Kelp but should be Under the Sea) is described as a shimmery sea green has hints of blue shimmer running throughout,which is Daphine Polish's interpretation of a mermaid's tail. An upscale spa-type scent that is fresh, clean and full of salty ozone. Notes of watery greens are surrounded by white musk and vetiver. The color is really pretty especially with that blue shimmer.No issues to report. Moscato is described as being jam packed with gold glitter, gold flakies, gold shimmer, and gold holographic sparkle.What better way to embody this light gold fizzy adult beverage? Fragrant red grapefruit and pomegranate are laid atop a bed of green apple and fruit blossoms with a delicate finish of smokey musk and the barest hints of rose and geranium. This polish smells delicious!! It applied perfectly with no issues. 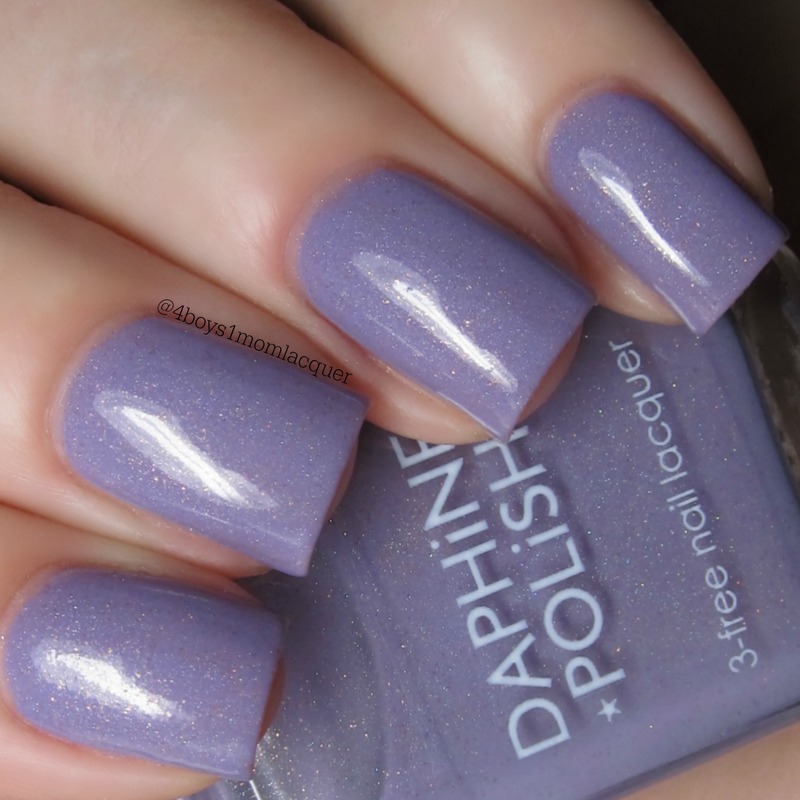 Sweater Weather is described as a dark grey creme with blue, purple, and grey shimmer flakies. Bundle up! Juniper berries, fresh eucalyptus, and sage with just a tiny bit of woods, sweet spearmint, and dew mixed in. This polish is so pretty.I love everything about it.It's one of my favorites in this collection.Clean up was easy for me because I did not get the polish close to my cuticle area.No issues to report. 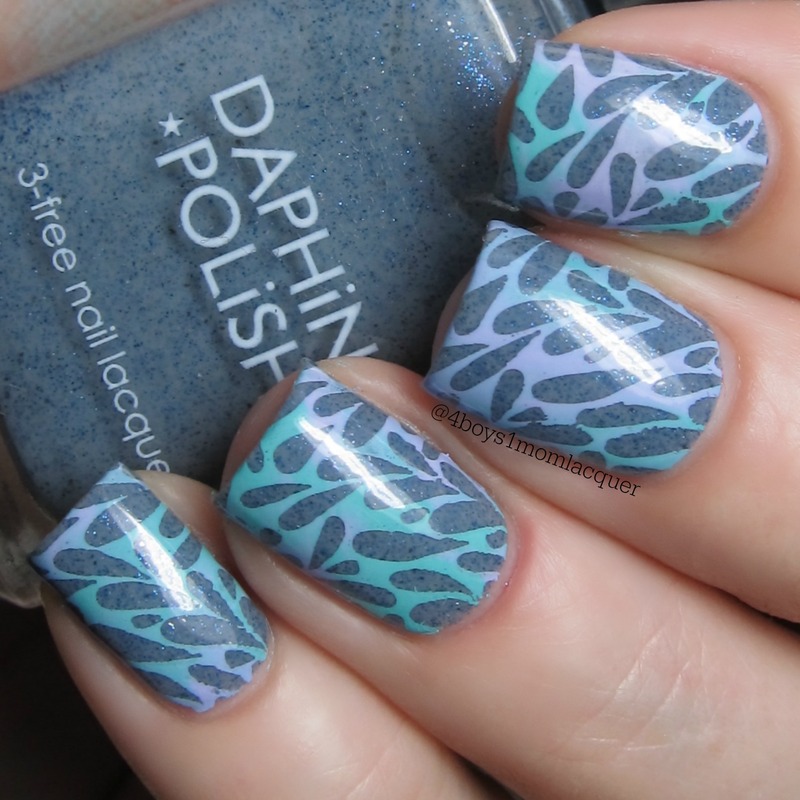 I also did some stamping over Sweater Weather using colors 16 Lilac and a teal color from Mundo de Unas. For more information on this collection be sure to check out all of Daphine Polish and Bumblesoaps social media sites.The links are posted for you below. What do you think about the collection?I can't wait to see what will be in the gift sets from Bumblesoaps. How's your weekend going?I took my puppy Diesel to the vet today to get his shots and his nails clipped.Let me just say,that boy hates being on a leash.He was squirming around like he was being tortured. LOL He was not having it. He weighs 17 and a half pounds now and he's only 11 weeks old,well he'll be 11 weeks old tomorrow.He's getting so big!! Anyway let's talk polish.I have the last 6 polishes that are VIX Emporium exclusives,made by Philly Loves Lacquer to show you.Emily of VIX Emporium actually helped name all 18 shades for her shop.If you see a polish you like and it's not in her shop,that means they are sold out.BUT the polishes will be restocked again in about two weeks or so.To see the last 12 shades of polish you can check out Part 1 here and Part 2 here. 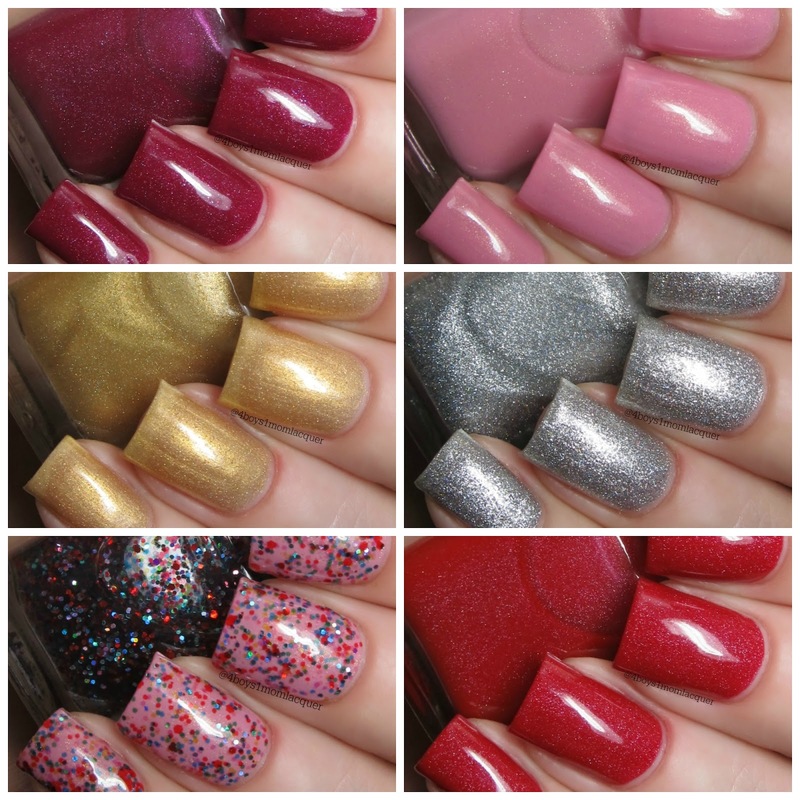 Oh,these shades will only be sold in VIX Emporium's shop.Now lets look at some polish,shall we? Talking Headz Teal is described as a medium creamy blue-green teal with blue-violet micro glitter. 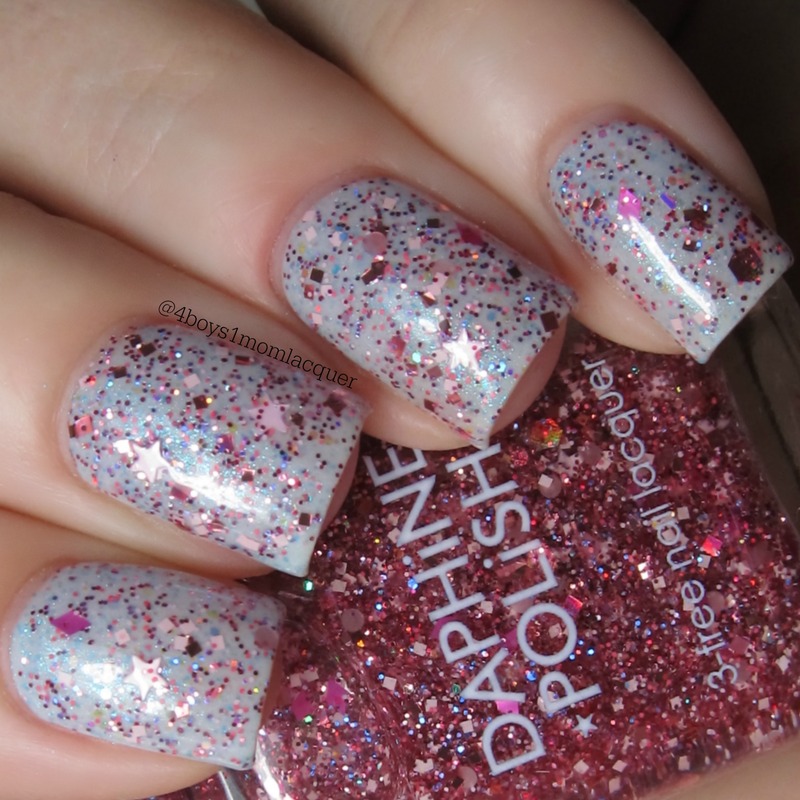 This is a very pretty polish. It is a little sheer with 3 coats.A fourth coat will make it completely opaque.I think it looks beautiful with the sheer finish. Talking Headz is a punk-inspired hair salon on Baltimore Avenue, specializing in dry-cut styles from ordinary to outrageous. Their first location's interior was painted a rich teal color. Clark Park Turtle Taupe is described as a tan taupe crelly with gold shimmer and holo micro glitter. Fiumé Fuchsia is described as a medium coral pink with soft pearlescence and subtle golden shimmers. I did not have any issues with this polish. It is a little sheer.For a more opaque finish I recommend applying a third coat. 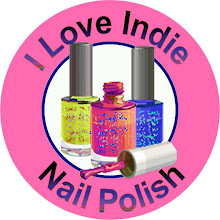 I also did some nail art over Fiumé Fuchsia. I also used another polish from this collection. I used Activist Amethyst and sponged a little bit of it onto my nails.Then I stamped over it using Mundo de Unas 12 Cream stamping polish and a image from my Pueen 79 plate.I love how it turned out. Fiumé, dive of your dreams. Top-notch beer & whiskey selection, amazing live music, eclectic clientele, size of your living room. Fu Wah Blue Wah is described as a bright blue crelly with gold flecks and holo micro glitter. Activist Amethyst is described as a medium-dark violet with shimmers of indigo and rose gold. This shade is my favorite out of this half of the collection.I love the color and the way it sparkles when the light hits it. It's truly amazing.No issues to report. West Philly is home to many diverse communities of activists, anarchists, free thinkers and freedom fighters. This color celebrates them and all they stand for. Mantua Mint is described as a pale creamy mint green (think mint chocolate chip ice cream) with tiny, shimmery aqua glitter. I did not have any issues with this polish. It applied nicely. It is sheer and I wouldn't have it any other way.It's fabulous! I did some stamping over it using Konad Black stamping polish and a image from my Pueen 75 plate. 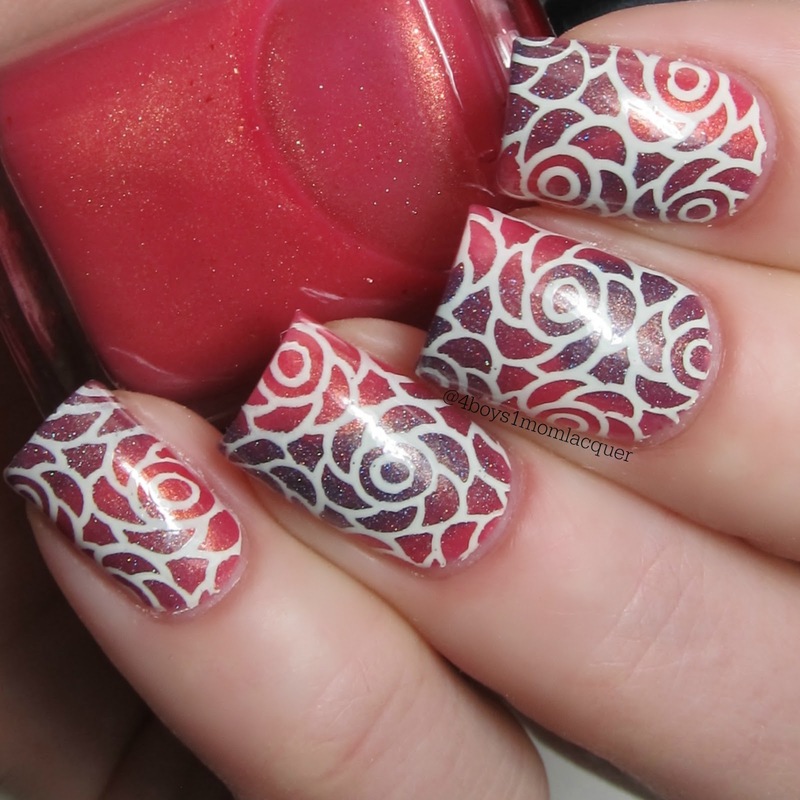 I did not wait long enough for the stamping polish to dry.So of course it smeared. Errrr!! I also added a flakie top coat. Well that's it folks!! I hope you enjoyed all of the VIX Emporium exclusives.They sure are pretty and I had a lot of fun reviewing them. If you see a shade you want and it's out of stock,check back in about 2 weeks or so. For more information on these beauties be sure to check out VIX Emporium's and Philly Loves Lacquer's social media sites.The links are posted for you below. I am back with 6 more VIX Emporium exclusives made by Philly Loves Lacquer.These shades will only be available in VIX Emporium's shop.There is a total of 18 shades in this collection and 3 new shades will be coming soon.Yesterday I reviewed 6 shades,if you missed Part 1 you can read it here. Lets go ahead and take a look at these beauties below. Kingsessing Crimson is described as a classic cool red with subtle color shifting holo flecks. This is a beautiful shade of red with amazing formula.I did not have any issues with it.This shade would be perfect to wear during Valentines Day.I absolutely love it. The Kingsessing neighborhood is just south of Spruce Hill and Cedar Park. Its name comes from the Delaware Indian word for "place where there is a meadow". There is still a naturally-growing meadow at Bartram's Garden nearby, the pre-revolutionary home of botanist John Bartram. The Gold Standard is described as a sparkly metallic gold with tiny gold and color shifting glitters. This applied nicely with no issues. It is sheer,but if you would like a more opaque finish you can apply a third coat.Personally I like the sheer finish. The Gold Standard is a lovely little cafe, restaurant and brunch spot at 48th & Baltimore. Its owners have been in business at various West Philly locations since the original Gold Standard on Chester Avenue in the 1970s. They now have a second location at 20th & Fitzwater in South Philly. 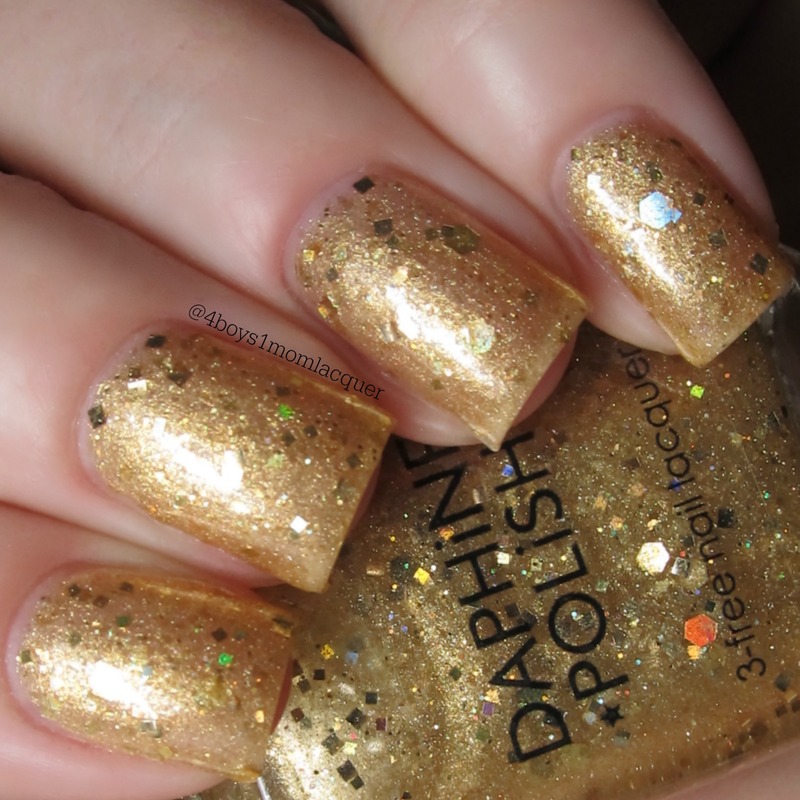 Mariposa Rosa is described as a soft pink crelly with a gold flash and gold microglitter shimmer. I applied 2 light coats followed by a quick dry topcoat. It's a very pretty shade of pink.This is also a perfect shade to wear during Valentines Day.No issues to report.I don't see this shade in her shop at the moment. Cedar Park Jazz is described as a clear base dotted with multicolor round and hex glitter, great alone or layered over another color. I applied 2 coats of Cedar Park Jazz over 2 coats of Mariposa Rosa,followed by a quick dry top coat. 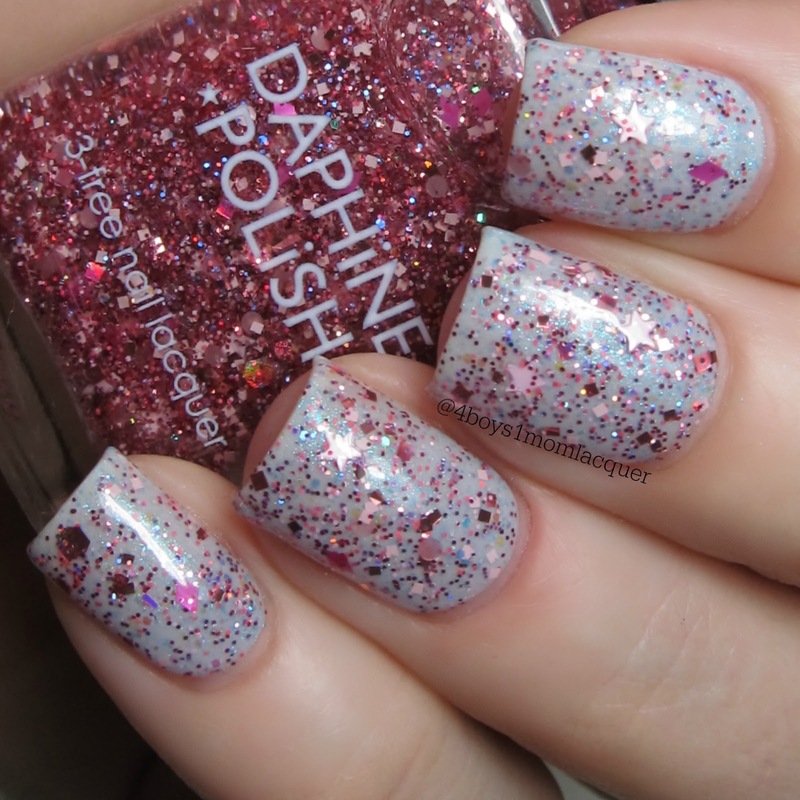 I am so in love with this glitter polish.This polish does not apply clumpy. All of the glitters lay really flat.I think it looks perfect over Mariposa Rosa.No issues to report. Cedar Park, a small but friendly space at 50th & Baltimore (right across from VIX) traditionally hosts free Friday night jazz concerts in the summertime. There's also a lovely little garden and a children's playground, a perfect breath of fresh air in the middle of the city. Baltimore Avenue Burgundy is described as a burgundy crelly filled with red and violet micro shimmer and a subtle holo. This shade is absolutely stunning!!! I would wear this shade every single day if I could.The formula is perfection.I didn't have a single issue with it.I also do not see this shade in her shop right now. Satellite Silver is described as a super metallic glittery silver with some subtle color shifting flecks. This is a flashy polish.I wanted to do some nail art over it. I wish I would have.It applied with no issues. The Satellite Cafe, in the Firehouse at 50th & Baltimore, is known for sweet vegan treats, black bean wraps, Bike Shop bagels, and blended drinks like the Kale Smoothie, the Nudge, and the Kick In The Pants. Visit for a cup of the best coffee around. For more information on these beautiful lacquers,be sure to check out VIX Emporium and Philly Loves Lacquers social media sites. The links are posted for you below. Have you seen any colors you have to have?